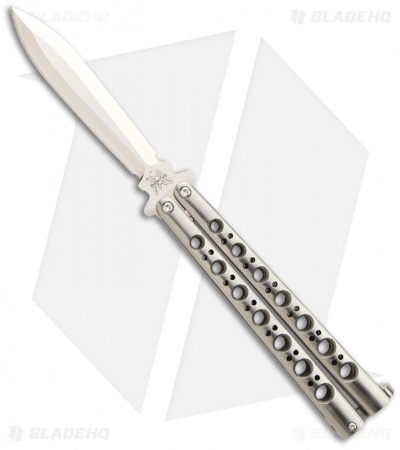 This Limited Edition Benchmade 46-01 butterfly knife is from a collector. The blade is marked "135/500" on the back side. It is in very good condition overall, with light signs of use and age. Does not include original box or sheath. Great collectors piece. Looking for a great butterfly knife? Few make anything better than the Benchmade 46 with a spear point style dagger blade. The blade is D2 steel with one edge sharpened and the other being a false grind. The handles are milled titanium. The 46 also has a titanium t-latch to secure the knife open and closed. Includes a black nylon sheath for easy carry. Be sure to view our other Benchmade Balisong Butterfly Knives in stock!